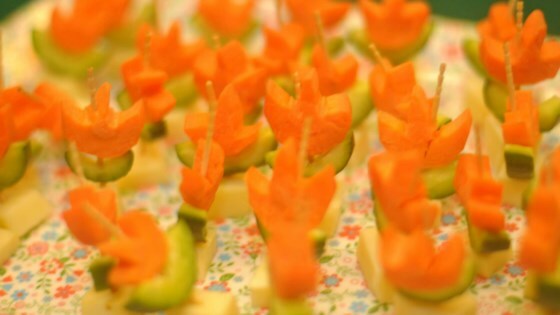 "If you are looking for healthy finger food for your kids' birthday, try these fun flowers made out of carrots and cucumbers. Kids can help assembling them." Cut cucumber in half lenghwise and slice into 1/4-inch thick slices. Cut out seeds so you end up with little crescent shapes. Slice carrot and cut out 2 small triangles on one side using a sharp knife, so the carrot slice looks like a tulip. Skewer the cucumber crescent onto a toothpick, followed by a carrot "tulip". Add a square or rectangular piece of Cheddar onto the toothpick if you like, so it looks like a flower pot.